DNA tests are all the rage right now, and for good reason. With a simple test you can perform at home and then mail away to a lab, these nifty kits unlock a wealth of information about a wide range of things from family history to genetic predispositions. AncestryDNA is one of the biggest names in at-home DNA testing, and the company is running a fantastic deal for Prime Day 2018. From now through the end of the day on Tuesday, July 17th, you can get the AncestryDNA: Genetic Testing for just $54.99. That’s $45 savings on the company’s most popular DNA test, and it’s the lowest price ever on this kit. 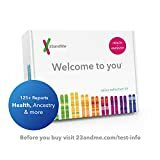 Also on sale at its lowest price ever is a best-selling DNA test from 23andMe, the 23andMe DNA Test Health + Ancestry Personal Genetic Service test. It retails for $299, but it’s on sale at a massive $199 discount for Prime Day so you’ll only pay $99.99!